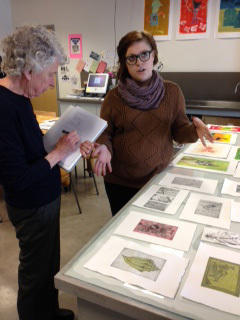 Thirteen members gathered Thursday, 4/23/15 at the Highpoint Center for Printmaking at 912 W. Lake St. in Minneapolis for an introduction to the art of Dry Point Printing. Members brought 4" x 6" drawings to transfer onto zinc plates. 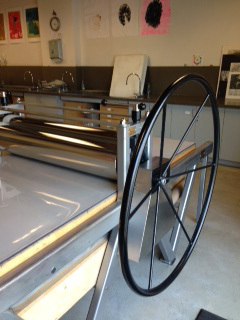 They inked and prepped their plates, and they participated in operating the printing press. For some, there was enough time to refine their images and reprint. It was magical to see the images emerge! We worked with black ink, but colored ink is also possible, and watercolor can later be added to the images. Many thanks to the Highpoint Center for facilitating the session!